The concept of our women’s rugby club was born in the Fall 1972 during a tournament in Kansas City. Many wives had traveled to the tournament with their husbands who played for the St. Louis Rambler Rugby Club. When a women’s rugby team was seen playing during the tournament, the Rambler wives decided to form a team of their own. The wives were joined by girlfriends, other friends of the Ramblers as well as nurses from Jewish Hospital, and formed the Pink Ramblers. The Pink Ramblers were coached by the St. Louis Ramblers for 10 weeks, and on Sunday, April 22, 1973, the ladies played in the first women's match in St. Louis against the North St. Louis Women at the St. Louis Easter Ruggerfest Tournament. The Pink Ramblers continued to play matches both home and away throughout 1973-1974, but found difficulty in maintaining a team as a Rambler-only side. Thus, they joined other local players and interested players and formed the STLWRFC in 1974-75. They chose sky blue and navy blue as the club colors, and within the first year they hosted a women’s rugby invitational tournament. In the first years, the team was coached by several members from the men’s rugby community: Don McGuire, Kokie Murphy and Keith Seaber (St. Louis Rambler Rugby Club); Terry Ford and Morris McDevitt (St. Louis Falcons); Joe Dresch (Norsemen or North St. Louis). St. Louis first won the Ozark tournament in 1978. They then went on to win the tournament in 1979, 1981, 1984 and 1987. Home matches were played in Forest Park at Langenberg Fields and Marsha Birkby coached the team for many years. Rumor has it Marsha did not allow anyone to retire while she was coaching, so their numbers remained consistent in those years. In the mid 1990’s, membership began to steadily increase and this strength allowed the club to adapt to the ever-changing structure of the senior women’s club championship format. Practices were held at Aviation fields in Forest Park. Coaches during this time incluced James Bell of the Bombers and Rick Tissell and Steve Elfrink of the Hornets. St. Louis Women's Rugby was oftentimes a player-coached team. In the late 1990’s Lori Brinkman transitioned from player-coach to head coach and MaryAnn Lane (MA) semi-retired and began coaching the forwards. An informal summer 7’s program was introduced. The first tournament the 7’s team entered was the Duck’s 7s tournament in Iowa City. Other tournaments followed with trips as far away as Pelee Island, Canada where the team was the overall tournament winner at least once and the talent show winner quite often. In the Spring of 2004, the club added “Sabres” to its name. Under the leadership of coaches Ed Reed and Phil Reed of the Bombers, the team advanced to the Sweet 16 round of the Women’s National Championships in Minneapolis, Minnesota. The St. Louis Sabres Women’s Rugby Club celebrated its 30 year anniversary in 2005. In its 30+ years of existence the club has had many committed coaches, fans and Old Girls. One of the founding members, MaryAnn Lane can still be found on the sidelines of most Sabres home matches. MaryAnn’s home has been host to countless Christmas parties, pool parties, after-parties and unexpected overnight guests. One room of her house is dedicated entirely to the trophies, photos and other treasures of this team. Sky Blue and Navy Blue remain the colors of the St. Louis Sabres today and the heart and dedication of the team remains solid. The 1976 Peachtree Invitational Rugby Tournament program quotes the St. Louis team representative Peggy Parrish, “We play rugby because we enjoy the sport. There is a great challenge in learning how to execute plays properly and a personal satisfaction in following a game well played.” Founded in 1975, the Sabres are St. Louis’ oldest, most-successful women’s rugby club. 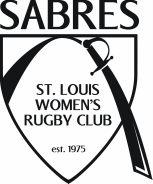 The club adopted its current name, “The St. Louis Sabres” in 2003 after being known simply as “The St. Louis Women’s Rugby Club” for many years. The year 2015 celebrates 40 years of STLWRFC. Rugby traditions continue to thrive with the team, with the players continuing to act as a family and not just teammates. The Sabres are members of Mid-America Rugby Football Union and compete in the Women's Division II League. We need YOU to sponsor our initiative to keep St. Louis Women's rugby a strong and vital club.